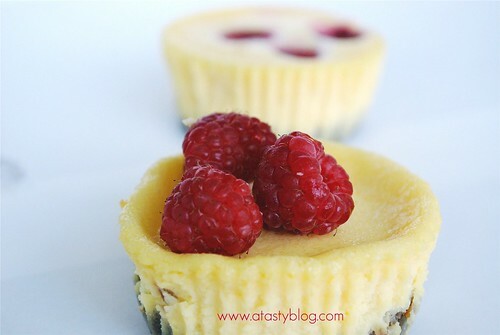 Mini Raspberry Cheesecakes, originally uploaded by Lameen. It's much easier to make these using a muffin tin, but use the muffin papers too. So set aside 12 muffin paper cases. Place in a 180C oven for about 10 minutes, take out and cool. Now make the cream cheese filling by mixing together 200g of cream cheese, 200g of creme fraiche (or mascarpone), 150g of caster sugar, 2 eggs, 1 egg yolk, 1 dessert spoon of lemon juice and 1 teaspoon of vanilla extract. If you are using fresh raspberries (almost out of season), place 2-3 per cheesecake muffin case - these will sink to the bottom - see the mini-cheesecake in the background in the pic at the top of this blog. Place the muffin tray on top of a baking tin with hot water - you need this for even baking. Bake for 15 minutes - don't worry if the cakes puff up, they will fall slightly upon cooling. Let the cakes cool, place in the fridge for at least 6 hours (as they are mini) and they are ready to enjoy. In season now are Cape gooseberries, so you can top the mini-cheesecakes with them. Delicious as the acidity cuts right through the cheesecake. But you can top with whatever you want or just enjoy by themselves, yum. Looks lovely and cute. I simply love those cakes. Perfect little treats and wonderful dessert.https://www.yousendit.com/transfer.php?action=batch_download&send_id=817789614&email=7cff47bb7cdcb76fbfa15e66c81a1961 I dont like using cape berries. I prefer using strawberries.Simply love the color combo.. I love mini anything and these are simply adorable!